We love a lifestyle cookbook and one that really takes what we do in the kitchen to other centers in our day to day. We talked with Melissa Coleman about her new cookbook, Minimalist Kitchen, hyggelig and how she solves problems as a maker. 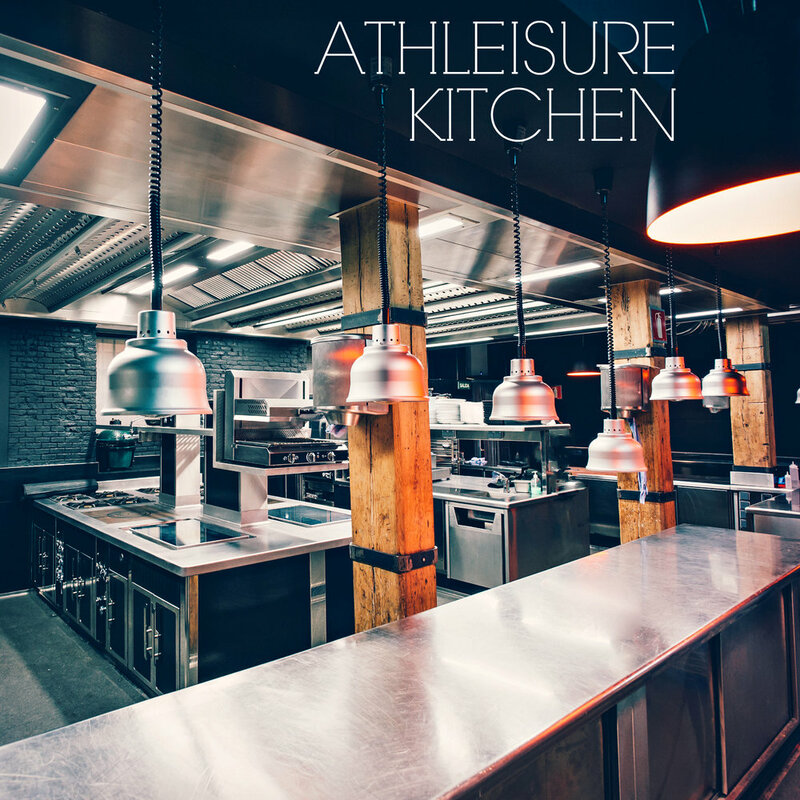 ATHLEISURE MAG: Tell us about your background and how you came from being a graphic designer, to a food blogger to now releasing your first cookbook as an author! MELISSA COLEMAN: It’s my first book and maybe my only haha. I said before that I could not make a book unless it would pour out of me. I never thought that I would make a book until they called me and I was like yes! A little bit about my background, from the earliest days of my life, I have always been a maker. I like to make things and my medium has changed over the years, but I also came out loving food. My mom would say that I would sit at the breakfast table and would ask what was for lunch or for dinner for the day. She would always say, “Well, Melissa eat to live – don’t live to eat and I am still living to eat." I love food! So, I painted in high school and then I studied graphic design and became a graphic designer. About a year after becoming a graphic designer, I started my blog about 10 years ago as everyone had a blog. It was probably the second post that it turned into a food blog as it documented my recipes. I cooked a lot in high school as I liked to bake and I used to love watching Martha Stewart. It’s not a joke, but I used to workout to Martha Stewart! MC: Yeah! That was the early days when I was in college I used to record it. So, I would record her and then I got home from work, I would workout to Martha Stewart. So that’s where I learned to cook and bake in a lot of ways. I wanted to know how to do everything. I like to make things and at my core, I am a creator. With food, I felt that as a designer, designers try to solve problems beautifully and with food, I needed recipes that were simple and wholesome and I tried a number of diets over the years. By the time I finished college, I landed on a whole foods diet. I like to eat whole foods and a vegetable forward meal. The vegetable forward part came into the blog later. As a designer who likes to solve problems, I created recipes of things that I wanted to eat. AM: What is a Minimalist Kitchen? MC: A minimalist kitchen is a paired down kitchen or a kitchen equipped with the essentials. Everything from the ingredients, to the cooking tools to the pantry – which is always the biggest trouble maker in the home as well as the techniques. I wanted to use efficient and even repetitive techniques. I didn’t want to reinvent the wheel as I cooked. I want to be really good at what I am doing especially at 5pm on a Tuesday at night. It’s pairing down to the very best things for the essentials. AM: Is this throughout your lifestyle? MC: I do. It’s funny, in the book I say, “Where minimalism starts and stops in your life, let it be”. Because, I found success in the kitchen by just getting rid – I mean I have kind of always been a reductionist. When I painted and you looked at my style at the end of my painting career, it was very minimal. Then you look at my graphic design style – I’m a reductionist who likes the essentials. I don’t like to do things for the sake of doing things. That naturally flowed over to my life and part of that as an adult, and it wasn’t true as a child – I wanted to be responsible for less and when I keep less around, I am responsible for that and it gives me time to do the things that I want to do or that brings me joy. It extends to my closet, I kind of have a uniform and my friends know that I wear the same thing all the time and we laugh about it and I don’t care! I like to pay attention to my habits and partly because I have always had a designer brain and that’s partly because as a kid, I would get frustrated about things and I remember my dad looking at me one time saying, “Do you want me to take you to this person to help you fix it?” And I was like, “No I will fix it”. And that’s kind of how I go about life. When I looked at my drawers, I would look at my clothes that would stay folded most of the season, the jeans on the floor that I would wear every single day and that was happening in the kitchen too! I would have one spatula that I would always use and so I started to pay attention to that stuff and I started to get rid of stuff that was just collecting stuff and taking up space. AM: Your book reminds us of our interview with Meik Wiking about hygge. AM: And when thinking about that, it brings up notions of comfort and cozy things – how does this lifestyle and minimalism come together within this concept? MC: Well minimalism can be seen as a stodgy, cold and austere word. But I don’t describe my approach as that. I say, that as a designer, I am a cozy minimalist. That’s kind of where hygge is – it brings the cozy in. Aesthetically, I try to bring visual warmth. Hygge is like the practical warmth. It’s sitting in front of the fire, playing a game and signing off from the rest of the world. It’s saying no to things or just being. Even for me, it’s a 2pm break in the afternoon because I need it and I am giving myself what I need and it goes back to responsibility. I wanted to be responsible for less so I deleted a lot of things that were in my life so I could do those things that I find most fulfilling. In those gaps and blank spaces, and there are plenty of those in our lives, which can be uncomfortable sometimes, we fill them with hygge moments. Just being, embracing the simplicity. Impotent is such a bad word but my fear is that I would become impotent of getting lost in the flicker of a flame or that I wouldn’t be able to taste the sweetness of an almond. That I would just overload my life with everything that I couldn’t see things for what they were. AM: What drew us to the concept of this cookbook is that over the last few years, cookbooks have grown from including a recipe and an image to showcasing a lifestyle. We love that this book showcases a methodology in organization and are believers in creating that sense of placement in one part of your life, allows you to do so in other areas and to obtain clarity whether physically or mentally. How did you decide that this was the way that your pantry should be, these are the items that will be slimmed down to x, what you considered essential agreements and how you basically can be a coach to people’s kitchens to conquer the madness that is in there! It feels weird to publish this book as this process is never finished for me and I am constantly thinking of reworking space especially in the kitchen. I like that idea too because it frees it up for people and it doesn’t have to happen over night. Life is organic and changing and good things take time. That’s the truth of this system, it takes a little time. AM: When it comes to the kitchen there are so many gadgets. We love our Breville Tea Maker, a number of items that we enjoy eating necessitate various products to make them versus having one tool that can do five things – so we’re always trying things out. So for you, when new things come to market and you feel that it works, do you do a mental checklist, where bringing in an item makes you remove something you have? MC: EXACTLY! I’m always doing a mental checklist and I am able to do that because I have so much less on my checklist. I am probably the slowest adopter when it comes to buying things. I don’t have an Instant Pot and I’m not sure if I will because I have all of the other tools that I need and it would be a huge learning curve for me and I’m not sure if I would do something like that in my everyday. But I am so careful as I picture myself at the back door of our house saying (even my husband is a much bigger shopper then me), “woah, woah, woah what are you bringing in here?” It’s going to require work, we’re going to have to reorganize and we will have to get rid of something. Why spend time doing something that we don’t need to spend time doing? AM: How did you go about organizing the cookbook and what would you say that someone should expect to read when they are going into it? MC: When I am cooking in general, I mentally lump my recipes into weekend cooking, weekday cooking and make ahead – and as we started on the book, I said can we create tags so that people know exactly where to put the recipes in their life? I mean, I know where to put them, but people don’t know what to do with my recipes. So we separated them like that so that people could have it and I wanted to set them up with the most success possible. I feel like overwhelmingly that people are frustrated with their kitchens – which was true for me. How many expletives come out when you’re opening the Tupperware drawer? There are things in the kitchen that are expletively producing haha. AM: So true and we get annoyed, stuff everything back in and then think we should do something about it! AM: It’s like the Groundhogs Day, Kitchen Edition! MC: Yes that would happen to me to! I remembered that my mom would deal with these things to. I used to think that she was so nutty and then I found myself doing the same things in my kitchen too!! I was like, “I can fix this.” I do think that it’s crazy and I want to acknowledge that I got the chance to really spend time on making my kitchen work and then to write about it! That’s a very rare opportunity and many don’t have time to do something like that because our lives are so busy – even a paired down one! I think that this book has done the work for people so that it will make them feel more successful in doing this and even down to where the recipe should go in their week. AM: I agree it’s good for them to figure out when they should prep, where in the week they should go to the grocery store, it’s a nice map to follow! Especially when you live in a place like NYC where even the simplest task of going to the grocery store can be quite a journey. You know that you can only carry so much and that there is an option for convenience, but do you want someone else picking out your produce? Logistically, someone sending your food to you is great but syncing up the times and for those that don’t have a doorman – this is a problem. It’s nice to have order. MC: True – even the shopping techniques, I shop a lot like a city dweller. I live in a large city but not like NYC – but I walk to the grocery store and I carry back everything that we eat for the week. I carry them on my shoulders like you do and I have enough fresh produce for what we eat that week and the pantry is stocked by way of Costco or other types of bulk shopping so I am only doing maintenance shopping or minor shopping. I hate grocery shopping with a child. AM: The anxiety of walking up and down the aisles everytime you get to the grocery store can be a bit much. AM: You know that you have to eat, you can’t do takeout all the time even if it’s healthy. But sometimes you get to the store and you hear all the sounds and other stimulations and you kind of need a plan to tackle it! So what are your 3 favorite meals from the book and what music do you play along when making those dishes? MC: Ok so I realized that my 3 meals are all weekend meals. I don’t want to take away from the deliciousness of the weekday meals. When I sit down to a meal that took 15-20 minutes it’s still so satisfying, but weekends are celebratory around here as it is in every home. So on Friday night we kick it off with the Crispy Pizza with the caramelized onions or a cheese pizza with the base recipe. Anytime it’s pizza night, we listen to the Mamba Italiano Radio on Pandora – it always feels like we’re at an Italian restaurant. Or we make these Summer Veggie Fajitas – we love those. They are a Stonehenge in our lives. We used to eat them out all the time and then we started making them our whole married life. On that night, we listen to Spanish Guitar Radio on Pandora. Then on Saturday or Sunday morning, it’s a flow brunchy type of thing so we make, the Dutch Baby because my 4 year old picks it. It’s magical because it just blows up in the oven and we listen to Early Jazz Radio on Pandora and it sounds like you’re sitting in a French or European café. Early jazz radio is so good! Read more from the April Issue and see The Kitchenscape in mag.